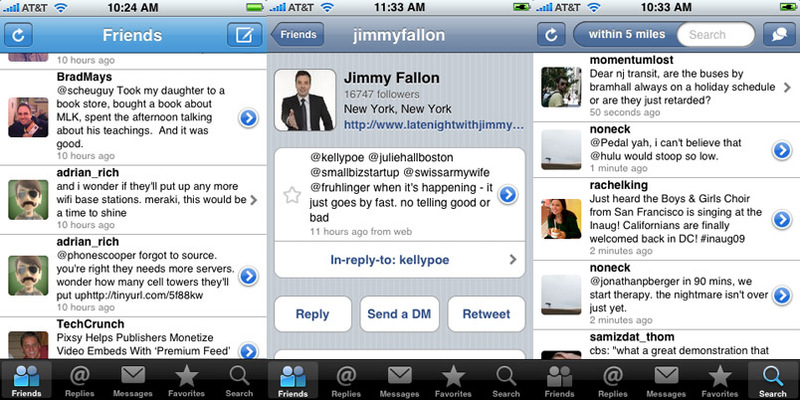 When the App Store launched, there were a handful of Twitter apps for the iPhone. Now there's ten zillion. We've read thousands of tweets on every Twitter app, so here are the best, and worst. 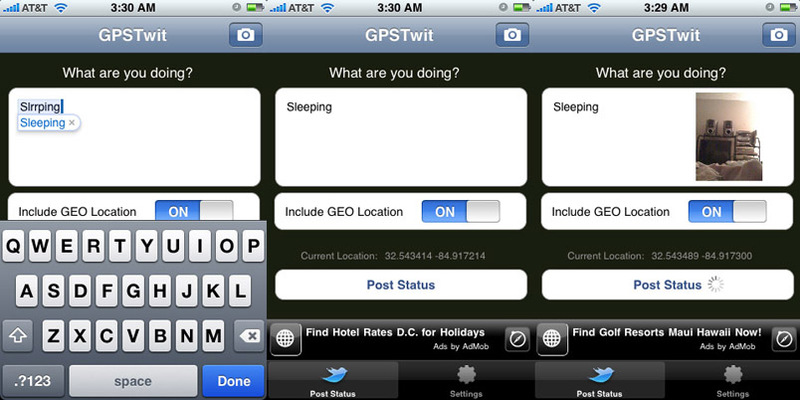 A tweet-only application (meaning you can't read other people's tweets, just post quickly) that distinguishes itself from the other minimalist one-way apps by adding GPS (with a link to your position on Google maps) and pictures to the equation. 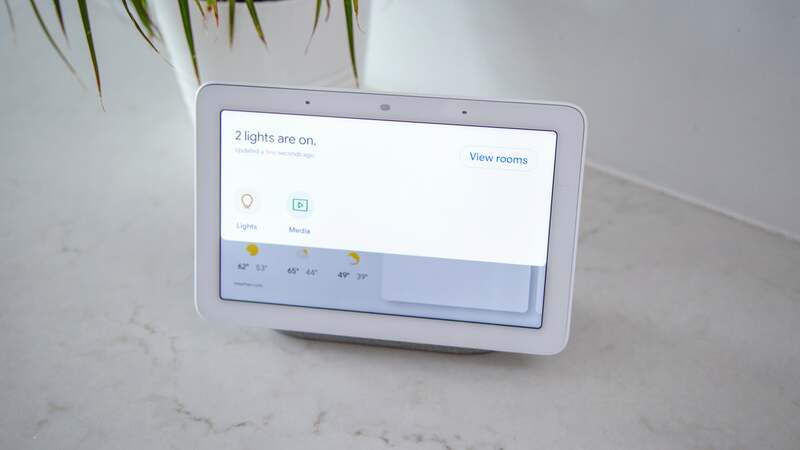 Pros: It has as much versatility as you'd want to pack into a single-function Twitter app. Cons: Not as beautifully simple as a single function app should be, and slow, which is fatal for an app that's supposed to blindingly fast. Annoying ads. 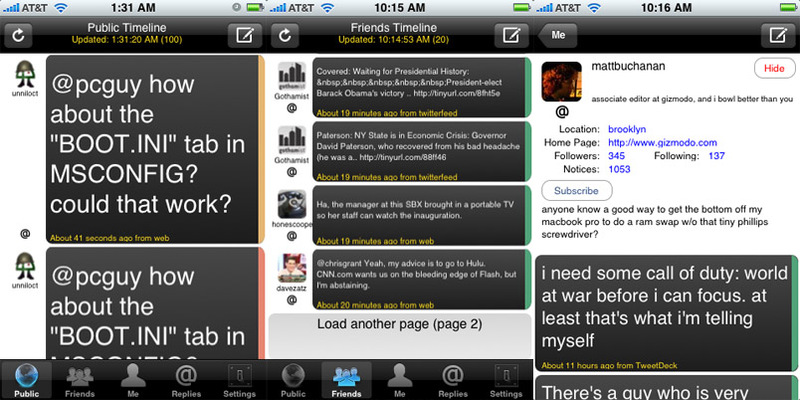 iTweets is basic Twitter app that aims for simplicity, merging all of your incoming tweets into a single, color-coded timeline. Pros: It has really pretty colours and a bemusing sense of single-mindedness. Cons: It blends all of your incoming tweets—from people you follow, @replies and direct messages—into a single sticky stream of goop that's unmanageable because of the way it's laid out—no icons means it's hard to tell who the tweet is coming from. And it's a buck! Boo. LaTwit is a pretty standard Twitter app that gives you all of the core functions, with a few useful customisations for easier reading. Pros: It lets you have tons of accounts and aggregate them into a single feed and gives you control over little things, like font sizes, and URL copy and pasting, that might make it endearing to you. Cons: Kinda ugly. It's buggy—goes catatonic often in the settings menu. It puts the public timeline front and centre (when I check Twitter from my mobile on a tiny screen, I wanna see what my friends are up to, not the whole world). Missing deep features, like search. Not worth three bucks. Nambu is a hydra, pulling in your Twitter, FriendFeed and Ping.fm accounts so you can social network and read what your friends are up to until your eyes and fingers bleed. Pros: The real selling point is that it combines three major microblogging-or-whatever-you-want-to-call-them services in one app. The reading UI is decent, clearly ripped from Twitterific, down to the colour scheme. 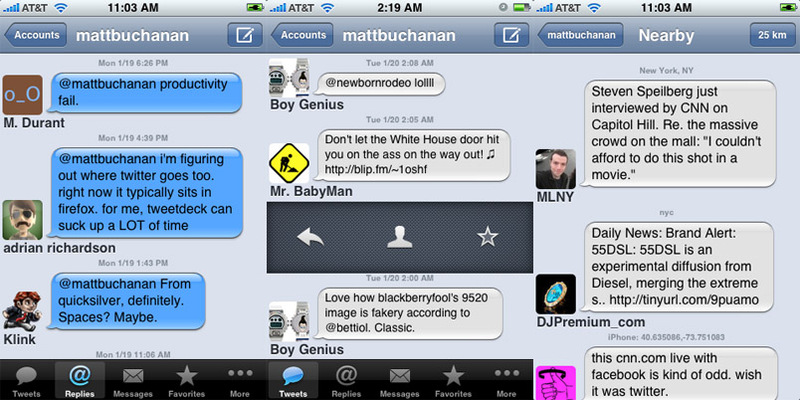 And uh, well, multiple social networking accounts in a single app! 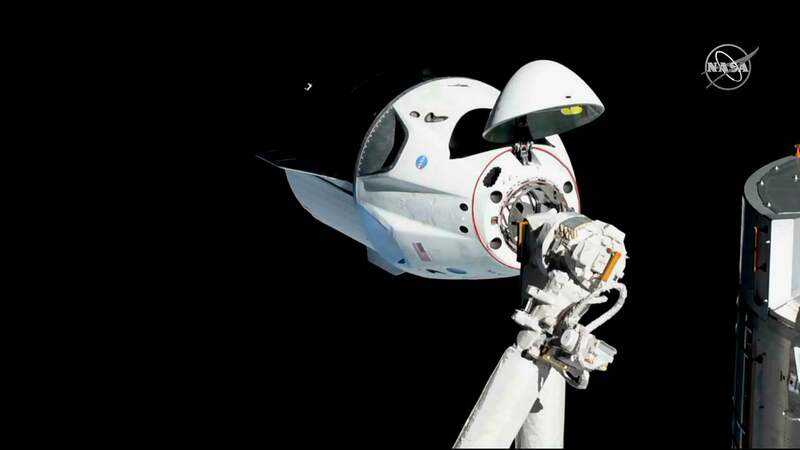 Cons: It feels like beta software: One of the five main buttons is for feedback. 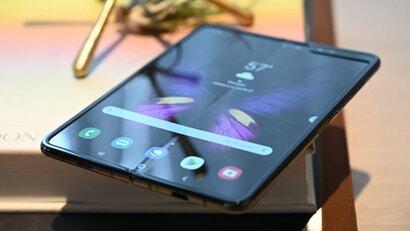 Limited screen real estate shouldn't be gobbled up by something like that. Despite ripping the UI from Twitterific, it's a little messier, with tiny, unintelligible buttons up top and not quite the same fit and finish. it's not immediately apparent what some of the buttons do. 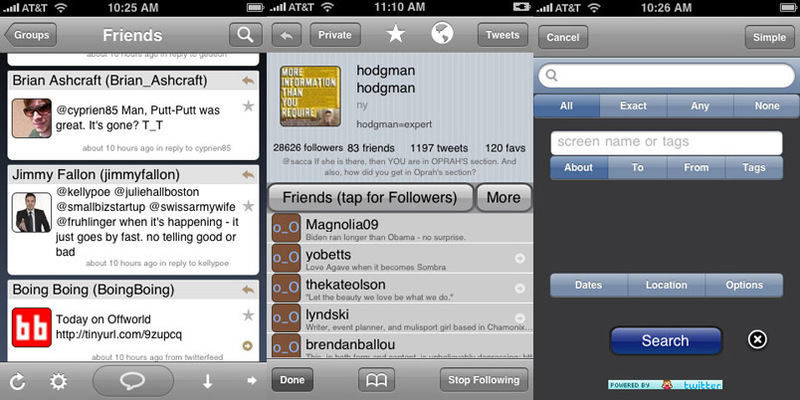 Robert Scoble might love this for $US2, but if you're just looking for that one great Twitter client, this ain't it. Another generic Twitter app, it does all of the basic things you want in a Twitter application, but there's nothing really special about it. 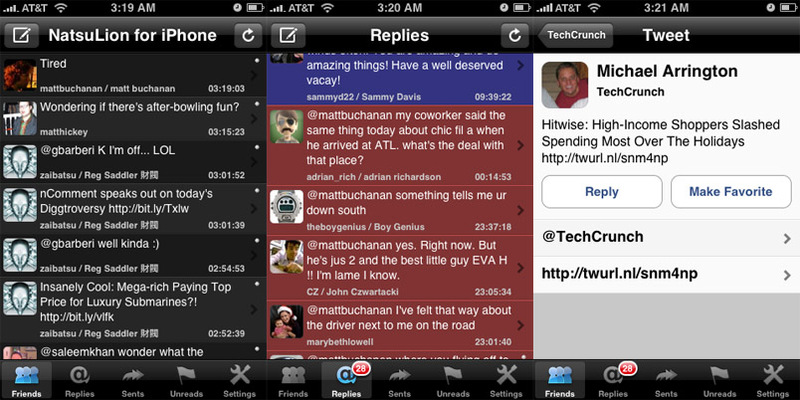 Pros: It has a separate section for unread tweets, which makes managing them easy. The lion is adorable! Cons: Too much text crammed into each box (which need to be more cleanly differentiated themselves), which makes it hard to read. 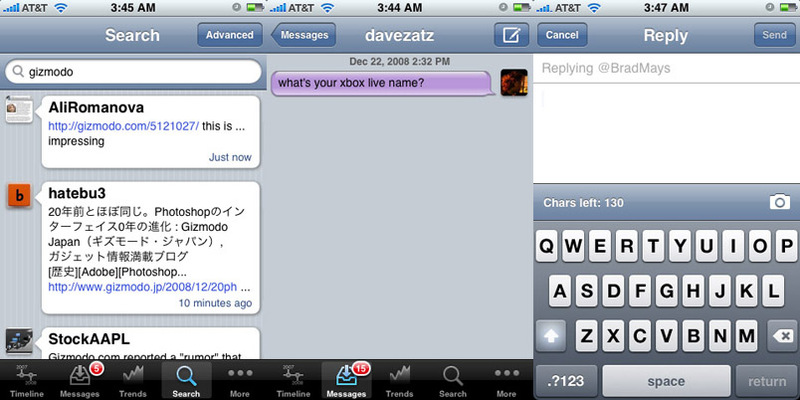 Blends direct messages and @replies into a single timeline, which might annoy some people. 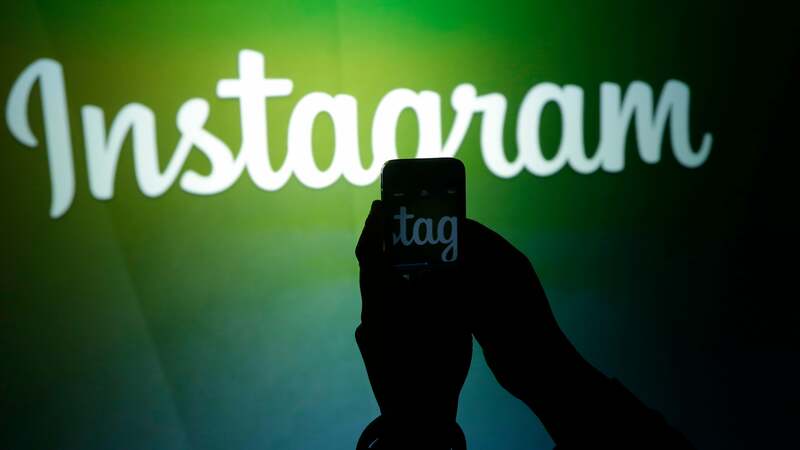 Skips out on features like search, and even picture uploading, which is typically taken for granted. It's a no-reading, just-tweeting one-trick pony. Pros: It's really fast for firing off tweets instantly. 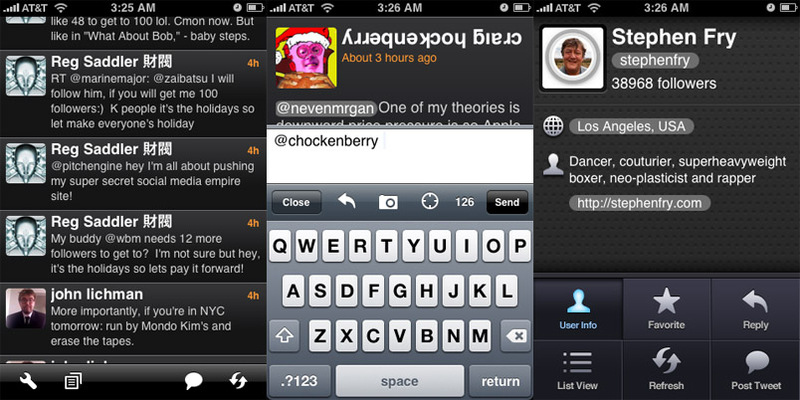 Tweetie is a powerful Twitter app with every feature you'd want, from multiple accounts to a landscape keyboard, packaged in a really well-designed UI that makes it a joy to use. Pros: Feature-packed, with bonuses, even, like flashlight and fart apps—in a UI that's never messy or scrambled by feature overload. It does the best job of squishing a full-featured app into a mobile one with a user experience comes that comes closest to what you'd imagine the perfect iPhone Twitter app would feel like. Totally worth $US3. Cons: It doesn't cache tweets, meaning you lose your reading list as soon as you close the app. 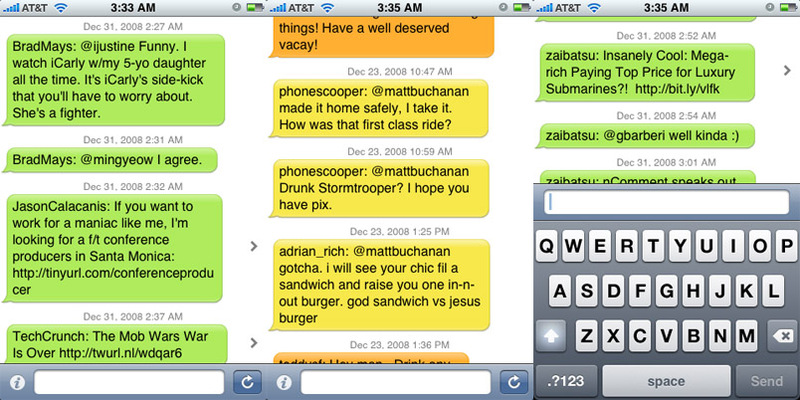 Some more theme choices would be nice—iChat bubble and "simple" doesn't quite cut it. 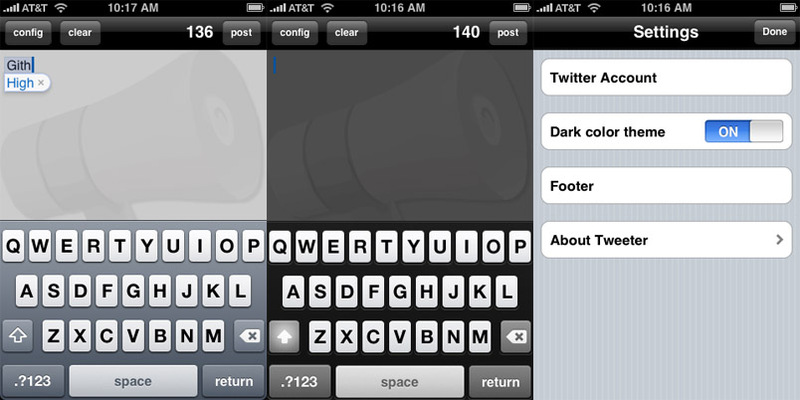 Not quite as superpowered as Twittelator Pro. TweetionTweetion wants to be a Twitter search app more than anything else, since that the first thing that pops up when you open it. It, uh, tries to do a lot of stuff too. Tries being the operative word. Pros: It archives all of your tweets from ever ever ago. It's like a trainwreck in your pocket that you can look at whenever you want for just $US5. Tweetsville's designers it seems weren't quite sure what they wanted it to do, so it does a little bit of everything, but it's not particularly great to use. Pros: It has every major Twitter function, solid search capabilities and in tweets, makes it abundantly clear who it's going to. That's about it. Cons: It's hard to immediately find core functions—a no-no on an app designed to be used on the go—and its uncertainty of purpose or design leaves a sorta sour taste in my mouth: Half the buttons on the bottom are dedicated to search and trend-tracking, while your @replies, which I think should be front and centre, are buried under a "more" menu. The UI is also inconsistent from function to function, and there's just not a whole lot of reason to pay $US4 for this when free or cheaper apps are much better. Twinkle had a lot of fanfare early on for its cutesy speech bubbles and location features that let you see what people are tweeting around you, which it was the first to do. 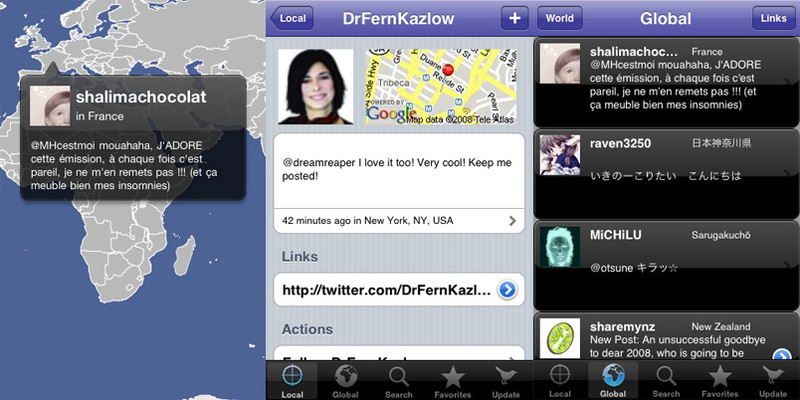 Pros: One of best clients right after the App Store launch because it was one of the first with deep location features, it still has strengths there, like a landscape view map of real-time tweets. The stars and bubbles theme is... unique. Cons: Its future development is questionable because of internal strife at developer studio Tapulous. It also requires a separate Tapulous account, which is really aggravating. In our view, Twitter apps shouldn't need anything more than our Twitter username and pass so you can start using them instantly. 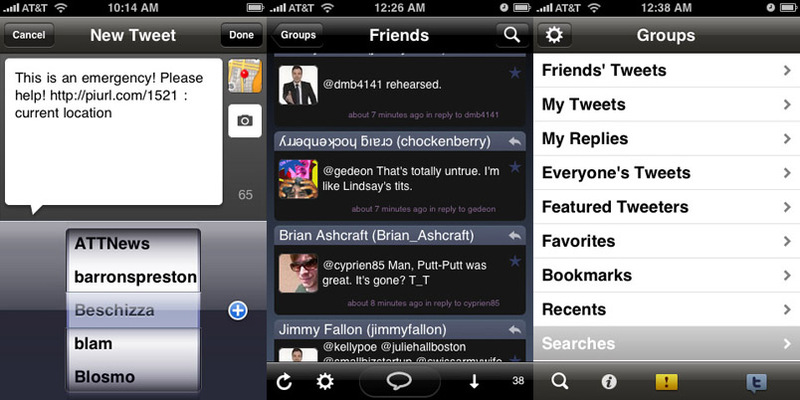 Twittelator's free app gives you more functionality than most free Twitter apps in a pretty solid little package. Pros: It's one of the better free Twitter apps, retaining Twittelator Pro's core functions—picture upload, search, GPS, friends list—though it doesn't stack up to its pay-for-it-dammit bigger brother. Less prone to freeze-ups than Twittelator Pro. 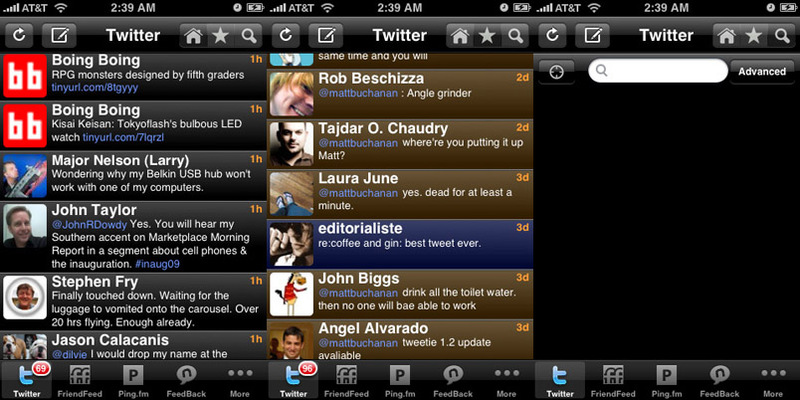 Cons: You lose all of Twittelator Pro's more powerful functions—not just themes, but multiple accounts, nearby tweets, in-tweet photo display, deeper profile diving and more—but you're using the UI designed for the feature-packed version, with a kind of ugly skin, too. The emergency tweet button is weird, and in an awkward place (dead center). Pros: The most powerful Twitter client with lots of customisation like multiple skins, and little touches like a friends list that makes it easy to @reply or direct message someone on the fly. Cons: The listicle-style menu for all the features is a tad bland, though it gets the job done. When it's trying to do something, it can be annoyingly unresponsive. The UI isn't the cleanest, either (admittedly, because it's trying to do so much) and some of the buttons are hard to hit. Pricey. 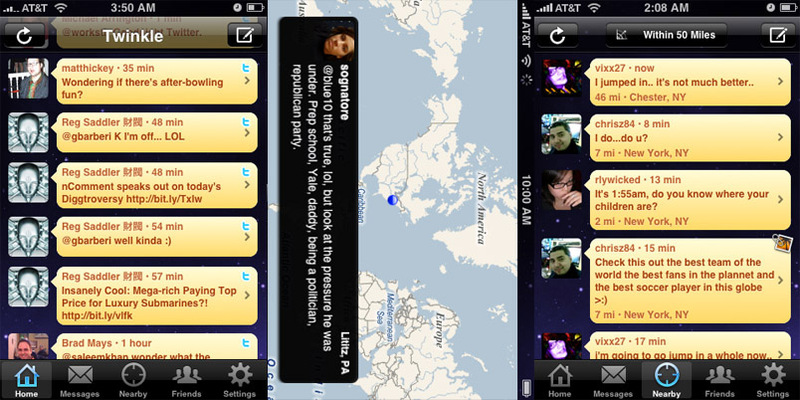 Twitfire is another one-way application that just lets you send tweets, not read them. Pros: Hrmmmm... 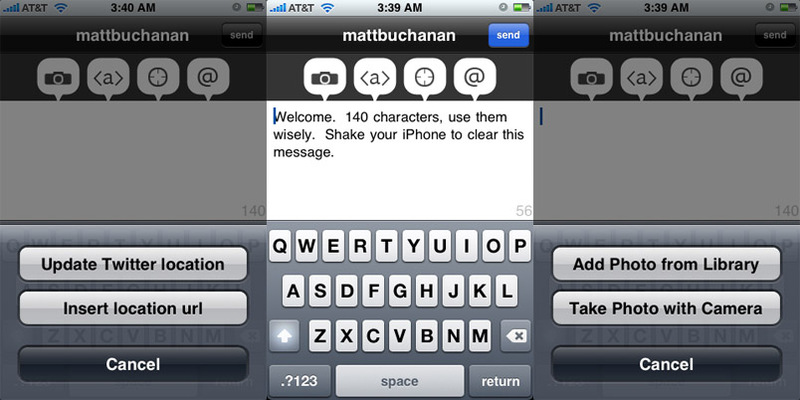 It makes it easy to send messages to your friends—which the other one-way apps don't do. Cons: Another post-only app that wants to be essential, but is just confusing. Do I push the button before I type? After? What's that button? The most straightforward full-featured Twitter app, it has every major function you'd want—search, profile diving, picture uploads—presented in the simplest way in possible. Pros: It's incredibly lean and loads a zillion tweets way faster than any other Twitter app in a simple, easy to read layout. It caches them too, meaning you can flick it on to do a tweet dump before you hop in the subway. The best free all-round Twitter app. Cons: Missing some power-user functions, like multiple accounts and themes (the baby blue does get on my nerves), and an option for a larger font size would be nice. Twitterific is designed around the reading experience more than anything, presenting all of your incoming tweets—from friends, @replies and direct messages—in a single stream with a fantastic UI. Pros: It's a great reading experience—it launches straight into the timeline and uses massive, readable-from-two-feet away fonts on top of a an essentialised user interface that's single-hand-friendly. Caches tweets so you can read your backlog even without a signal, which is great if you catch up on Twitter in the subway (like me). The free version and $US10 one are essentially exactly the same—the free one has ads and is just missing an extra theme. 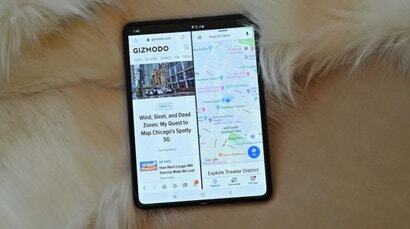 Cons: It was clearly designed for reading more than doing, so it's stripped of features like search, nearby users and more in-depth profile probing that makes it feel a bit shallower than other apps, especially if you pay $US10 for the premium version, which is the most expensive standalone Twitter app in the App Store. Also, everything's in a single timeline—your friends' tweets, direct messages and @replies—so there's no digging back for an older direct message or anything remotely tweet management. Rather than check out what the people you're following are up to, it bounces you around the world, following random, geo-located tweets in real time, or you can see who's tweeting near you in creepy detail. All to give you a "sense of the global zeitgeist." Cons: The amount of detail in local tweets, with a Google Map pin and all, is kinda creepy! You can't read what the people you're following are doing (granted, that's not the point).